I love Stash Busting and using up all those tiny amounts of yarn that I seem to end up with. You know that silly amount that is not quite enough to make a whole item with but you simply cannot think what to make with it. I found this The Big Knit A lovely way to use up all your fiddly bits of yarn and do something for others as well. So who or what is Age UK? They are a charity that helps the elderly will all sorts of things they even have schemes where you can get help with the garden and decorating your home. They do charge for the gardening and decorating but it is not a huge amount compared to employing a firm to do this. So I decided to join in the fun and make some little hats for the Innocent Smoothie bottles. 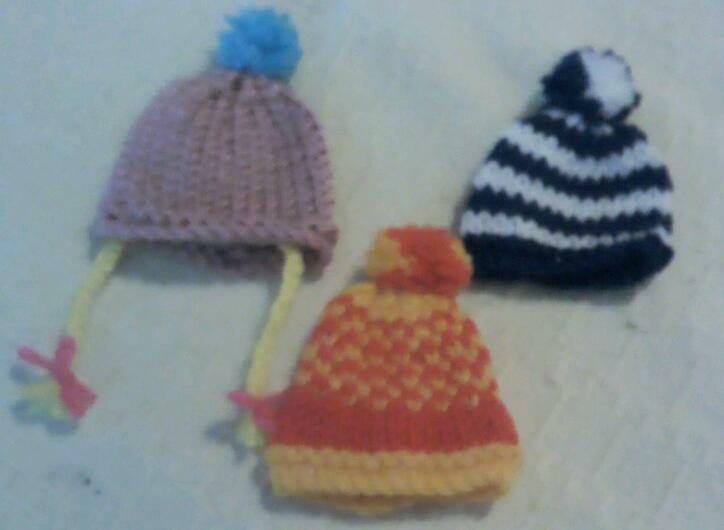 I loved making these little hats. I was able to experiment with using new techniques like using two yarns on the same row swapping the colours as I went. Green and Yellow one row the Yellow and Green the next creating a nice pattern. A funny little hat with odd eyes yes they were meant to be odd sizes and a tassel rather than a pom pom or bobble. A sun hat just for something different it is a nice orange colour with a yellow band around the bottom of the hat that I sewed in. 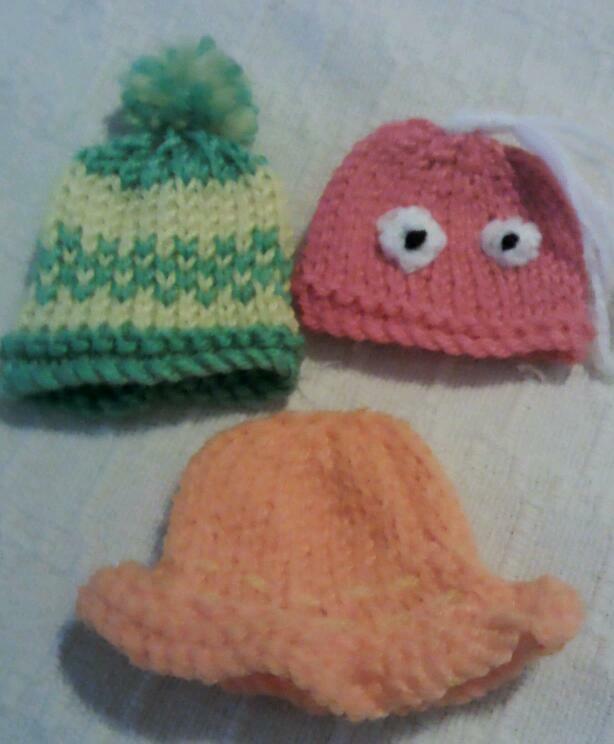 These were a little different a hat with braids, one that made using the two yarn method again this time in bright orange and yellow and a striped hat all with pom poms or bobbles. 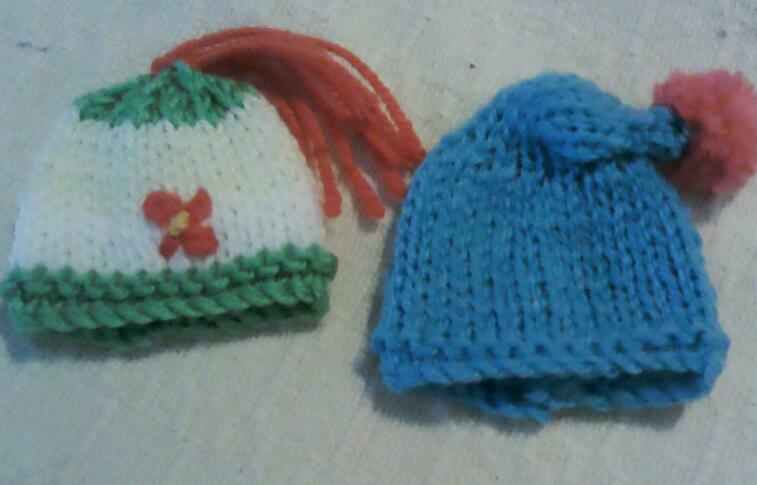 Two more that I made this time I embroidered the flower and added a tassel and the blue one is a sort night cap or as someone said a blue Smurf hat. All were easy to make and fun to do plus I used up some small bits of yarn that I had left over from various projects. As they seem to do each year I will make a lot more for 2014 so when I am fed up making larger things I can make these and help others as well. Fantastic variety here. I knitted some basic ones and will carry on through the year just to use up small bits. I might be a bit more adventurous from now on. I experimented with the basic pattern and added a few extra rows to make the bedcap. The sun hat was made by casting on double the amount of stitches then knitting two rows then k2 tog and follwed the pattern for the basic hat. It is fun to experiment and as they are small easy to undo if you go wrong. Have fun.